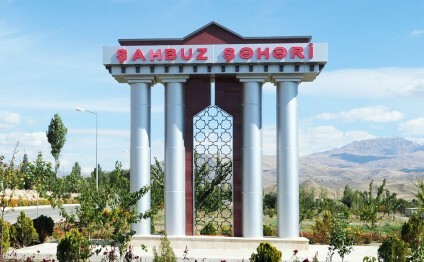 Shakhbuz district is located at the north of Nakhichevan Autonomous Republic. The administrative center of the district - Shakhbuz city. An ancient sites were found close to the Shakhbuz. Unusual residential places consisted of 4 rooms and one balcony were cut in the wall. Local inhabitants call this place “Farhad’s house”. This name is connected with the name of the hero of the poem of Nizami Gandjevi Farhad who in order to give water to his beloved cut rocky mountains and built a canal. In the other place archaeologist have found remains of powerful construction named after khan governed here some time ago “Shakhpur Gala”. 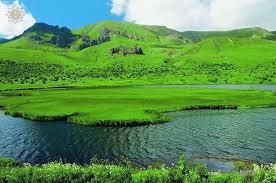 At the altitude of 1400 meters at the picturesque natural place is located a recreation area “Badamli”. Here is a plant for bottling of mineral water Badamli. The district has a deposits of minerals: sulphur, peat, construction materials. District is rich in mineral water – springs of Badamli, Bichanak, Batabat, Karvansaray and others. Climate is hot in summer and cold in winter. Through the district flows river Nakhchivanchay and its tributaries Salvarti, Kuku, Shakhbuz and others. There are also lakes Batabat, Ganligel and others. In forests one can find such trees like oak, beech and hornbeam. Fauna is presented by bear, Caucasian goat, lynx, wild boar, wolf, fox and others. By the way very soon Shakhbuz will become a tourist center because Shakhbuz district of Nakhichevan Autonomous Respublic is awaiting for urbanization. The Committee on regional issues of Milly Medjlis has recommended by low to enlarge the territory of this district at the expense of neighboring villages – Ayrindj, Daylagli and Garababa that are going to join the city completely. The territory of the Shakhbuz city will be enlarged almost twice – up to 2,826,6 hectares. The final goal of these changes – development of the city and its tourist infrastructure first of all.